EDITOR’S NOTE: In this RealClearBooks series, we highlight recent nonfiction books from across the political spectrum. 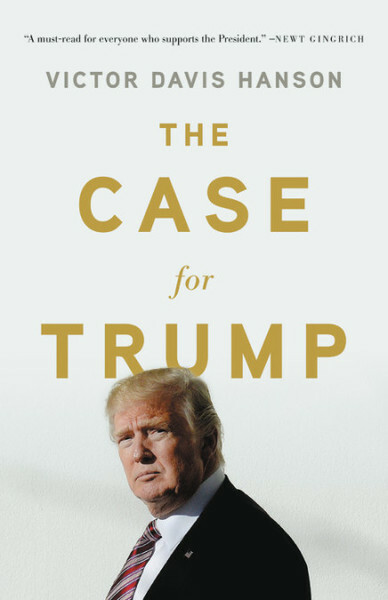 This week’s book is victor Davis Hanson's 'The Case for Trump', just published by Basic Books. Victor Davis Hanson examines the Trump Presidency through a classical lens, casting the Donald as a tragic hero straight out of Sophocles: a narcissistic savior whose mercurial personality is both the source of his power and, perhaps, his downfall. Hanson is among the most formidable of Trump's intellectual backers and thus the book has drawn predictable jeers from the mainstream left. But Hanson's take is refreshing, offering a new context to reconsider our unusual Commander in Chief. Michael Doran, National Review: 'Victor Davis Hanson’s newest book is also one of his most personal. Hanson is a celebrated historian of war, a retired professor of classics, a senior fellow at the Hoover Institution, and a National Review columnist. But he is also a farmer in California’s Central Valley. He routinely peppers his articles and even his academic work with telling details about farming life and social realities in Selma, a town outside Fresno where he lives in the same house in which he was born and raised. In this book, as in his others, the glimpses of Selma come only in support of Hanson’s wider thesis, never as part of an effort to tell his personal story. Nevertheless, beneath the surface of dispassionate analysis, the book burns with emotion.' Read the full review. John R. Coyne, Jr., The American Conservative: 'At the end of two years, this base of support for Trump remains solid. This is in part, Hanson notes, due to Trump’s recognition that “the America ‘era’ was not ending, but at that time enjoying the strongest GDP growth, job reports, energy production, business and consumer confidence, and foreign policy successes in fifteen years.” The latest figures show that this administration’s economic policies have resulted in the highest number of job openings ever recorded in the United States, with more women and minorities employed than ever before. How does it end? At the moment, the McGovernite field of Democrats offers little threat to Trump’s reelection in 2020. But reelection or no, perhaps Henry Kissinger, quoted by Hanson, best sums up what Donald Trump may come to represent: “I think Trump may be one of those figures in history who appears from time to time to mark the end of an era and to force it to give up its old pretense.”' Read the full review. John B. Judis, New York Times: 'Hanson, who is a retired classics professor and a senior fellow at the Hoover Institution, compares Trump to a tragic hero, who, crippled by “an innate flaw,” suffers a sorry end, but in the meantime does incredible good. Hanson acknowledges Trump’s “tweeting … feuding … unbridled and often vicious speech, even his fast and loose relationship with the truth.” He writes that “Trump likely will end in one of two fashions, both not particularly good: either spectacular but unacknowledged accomplishments followed by ostracism when he is out of office and no longer useful, or, less likely, a single term due to the eventual embarrassment of his beneficiaries, as if his utility is no longer worth the wages of his perceived crudity.”' Read the full review. 'This is what you were saying about Greek heroes. You don’t get the perfect person who will phrase everything or do everything perfectly. You don’t. You don’t. I was trying to look at Trump in classical terms, so words like eirôneia, or irony—how could it be that the Republican Party supposedly was empathetic, but a millionaire, a billionaire Manhattanite started using terms I had never heard Romney or McCain or Paul Ryan say? He started saying “our.” Our miners. And then, on the left, every time Hillary Clinton went before a Southern audience, she started speaking in a Southern accent. And Barack Obama, I think you would agree, when he gets before an inner-city audience, he suddenly sounded as if he spoke in a black patois. When Trump went to any of these groups, he had the same tie, the same suit, the same accent. What people thought was that, whatever he is, he is authentic.' Read the full interview. As an Amazon Associate, RealClearBooks earns a commission on qualifying purchases made through this site.